Have hours of fun with Triumph Sports Disc Golf Toss in your own backyard. This outdoor game requires concentration and strategy, yet it is fun and engaging for players of all ages. Disc Golf is played much like golf, except players toss flying discs instead of hitting golf balls. Players or teams compete to see who can land their disc in the target with the fewest number of tosses. This set comes complete with everything you need to enjoy this newly popular game. It includes one heavy duty steel disc golf target with folding legs, as well as three golf discs. 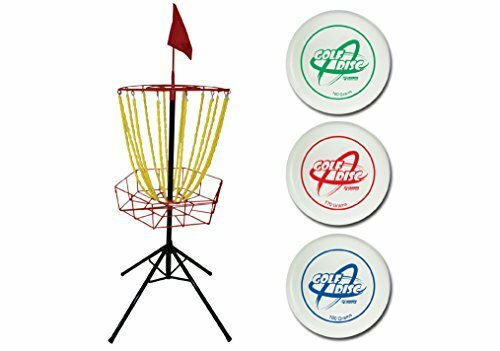 Each disc has a unique weight (weighing 160g, 170g, or 180g), so each player can choose the one that works best for them. The set also includes instructions for disc golf and two alternative game suggestions (Hole-in-One and 101 Golf), so you'll always have something to play!